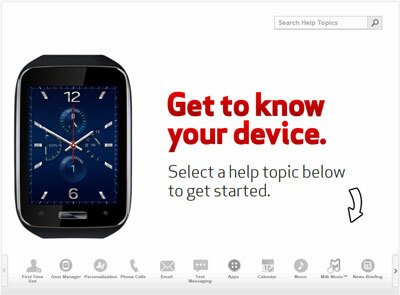 Find device-specific support and online tools for your Samsung Gear S.
Watch this video to learn to pair your phone and with your Samsung Gear S™ then walk through the setup process. Change the wallpaper, clock style and settings on your Samsung Gear S™. Learn how to adjust the band on your your Samsung Gear S™ in this video. Learn how to charge your Samsung Gear S watch. Discover how to pair your Samsung Gear S watch with your compatible Androidâ¢ phone or watch. Learn how to access the calendar on your Samsung Gear S.
A visual guide for setting an alarm on your Samsung Gear S.
A visual guide for viewing an alarm on your Samsung Gear S.
Here's how to view or clear the call history on the Samsung Galaxy Gear™ S.
An interactive guide on how to place a call to a contact using your Samsung Gear S.
Learn how to call a new number with your Samsung Gear S.
A visual guide for setting your Samsung Gear S to silent. Learn how to teach kids to dial 911 using your Samsung Gear S.
A visual guide for viewing a missed call and sending a text message to the caller with your Samsung Gear S.
To turn the mobile data for your Galaxy Tab S 10.5 on or off, follow these steps. If the display on your Galaxy Tab S 10.5 doesn't rotate, this shows how to fix it. Discover how to access the Settings menu for changing things like screen timeout and alerts on your Samsung Gear S watch. A visual guide for saving energy on your Samsung Gear S watch by adjusting the screen timeout. A visual guide for setting your Samsung Gear S to Airplane mode. A walkthrough for turning off the always-on screen setting to help save battery power on your Samsung Gear S watch. Removing then re-adding an email account on your Galaxy Tab S 10.5 often fixes email issues. A visual guide for replying to email on your Samsung Gear S.
A visual guide for sending an email on your Samsung Gear S.
Learn how to navigate to a location using your Samsung Gear S.
An interactive map of the most important features of your Samsung Gear S watch. A visual guide for navigating multiple Home screens on your Samsung Gear S.
Learn how to power on and shut down your Samsung Gear S watch. To turn Mobile Hotspot on/off on your Galaxy Tab S 10.5 or if you can't connect to Wi-Fi, see this. An interactive guide for changing the language settings on your Samsung Gear S watch. Learn how to control music on your paired device. Learn how to create a station in Milk Music on your watch. Learn how to install Milk Music on your watch. Learn how to play music on your watch. Learn how to listen to music with music on your watch. Learn how to get around your Samsung Gear S™. A visual guide for accessing and closing open apps on your Samsung Samsung Gear S watch. To check for or to install software updates on your Samsung Galaxy Gear S, view this info. Learn how to reply to a text message on your Samsung Gear S.
An interactive how-to guide for sending a text message with your Samsung Gear S.
Discover how to change the Home screen on your Samsung Gear S.
Discover how to change the background of your watch screens on your Samsung Gear S.
View this info if the Wi-Fi network you want to add to your Galaxy Gear S doesn't display. To remove a saved Wi-Fi network from your Samsung Galaxy Gear S, view this info.